With "Top Chef," "Hell's Kitchen," "Iron Chef," "The Next Food Network Star," and all the planned spinoffs of the above, cooking can now be considered a competitive sport. Tiger Woods drew 1.7 million viewers to the Golf Channel last month with his much-hyped return after surgery. That same day, 3.7 million took in Bravo's "Top Chef" season finale. Into that landscape, NBC launches "The Chopping Block." Will it bring anything new to the table? Even the name bears an unfortunate resemblance to the previous latest installment in the genre. The Food Network's "Chopped" premiered in January. Here's the premise: Two teams compete for $250,000. (Cue dramatic voice-over: "It's the chance of a lifetime.") Each group is given an empty restaurant space they must decorate, create menus for, and open virtually overnight. If this sounds familiar, that's because it's essentially a show-length version of the Restaurant Wars challenge on "Top Chef." No problem - reality TV has proved that we will watch a formula that works over and over again. Here's the twist (there's always a twist): The contestants operate as pairs rather than individuals. The eight groups include the likes of Angela and Samantha, a headstrong mother and her former Miss Pennsylvania USA daughter; Lisa and Michael, a chef and server who used to be married; and brothers Zan and Than. Each week a pair from the losing team gets sent home. The host is Marco Pierre White. He's not new, either - he hosts the UK version of "Hell's Kitchen" - but he's an inspired choice. The famously temperamental chef earned three Michelin stars at a young age, then later gave them back; at one time he was known for kicking out customers who irritated him. 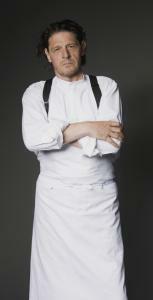 His kitchens have produced such talent as Gordon Ramsay and Mario Batali. There is potential here for both serious theatrics and serious mentorship. The contestants are going to need the latter. They have little concept of how service works, and the level of cooking isn't very high. "I don't like this dish," White says plainly upon tasting one contestant's sad-sack scallops. After he sees another's rack of lamb, he says, "He made me a dog's dinner." When the host turns the tables and cooks for the contestants, they are blown away by his sea bass with tomato, olives, capers, and basil - it's as if the concept of cooking simply with great ingredients is utterly new to them. Shows like "Iron Chef" have largely kept the focus on the food. "The Chopping Block" does too, at a different level. A recent New York Times story pointed out that ads are declining at magazines such as Gourmet and Food & Wine, while rising at practical ones like Every Day With Rachael Ray. "The Chopping Block" taps into that shift, as the recession drives interest in home cooking. The neophyte contestants on "The Chopping Block" are foils for the average viewer, and the viewer will learn along with them. The show has seasoned reality TV talent behind it, so it's a surprise to find "The Chopping Block" structurally jumbled, with hardly any time spent introducing the contestants. With so many beginners competing, everything goes wrong most of the time. One senses a few partnerships may dissolve during the course of the season. Another weakness: Restaurant critics "secretly" attend challenges - opening night, a party thrown for a fashion designer - but they're recognizable even with their faces blurred out. You'll see Corby Kummer of Boston Magazine and the Atlantic offering feedback; a contestant reports spotting Vogue's Jeffrey Steingarten, whom he knows from TV. At one point, White ominously says of the contestants, "They do not know how hard it's going to be." Yes, Marco, they do. They've seen it before. Devra First can be reached at dfirst@globe.com.